Read an account of what it is like to be an intern at the Malcolm Knapp Research Forest. Ira Sutherland, MKRF Graduate Intern for 2016, writes about his internship experience below. An internship at MKRF is guaranteed to be an insightful work experience. Being out in a research forest where active logging, wood processing, education, and research coincide provides an incomparable opportunity to see the different facets of forestry. Just being here is great: explore different forest types, including 70m tall old-growth forest; live in the century old staff house (Marc House); and swim in secluded private lakes below the Golden Ears peaks! The staff of 5-7 people in the office is like a small, incredibly supportive and very effective family. Based on my experiences, I would highly recommend pursuing an internship type, especially for someone looking to obtain diverse perspectives, skills and experience, all the while being in a friendly, beautiful, and relatively low stress environment. 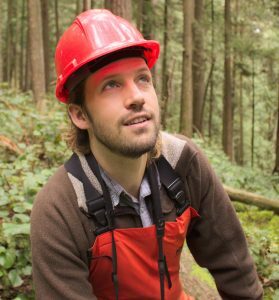 Here is a synopsis of my experience as a graduate student intern: after completing my MSc in Renewable Resources at McGill University, I started an 8-month paid internship at the UBC Malcolm Knapp UBC Research Forest (MKRF). My task was to help coordinate and lead the field component of a comprehensive forest field inventory project. One especially valuable part of the experience was the multifaceted nature of the project. To assist a wide range of objectives at MKRF, which include forest management, research and education, our inventory focused on collecting a wide range of data with numerous applications. Specific applications of my field inventory data included vegetation resources inventory mapping, lidar modelling, and establishment of permanent sample plots. To design our sampling efficiently, I had to learn the basics of how these information systems work, which was easy thanks to the incredible support from staff here and at the UBC Faculty of Forestry. Finally, I spent five months in the woods with a team of volunteers sampling 67 plots and over 3,000 trees. I did other stuff as well. I flew drones, managed safety on an active public logging demonstration, assisted First Nations cedar bark stripping, completed the S-100 fire suppression course, and designed educational displays for a stump museum. Overall, in this internship I developed technical forestry skills (field mensuration, forest cover mapping, trimple gps and differential correction, gps and mapping), as well as experience in project coordination, education, and field safety management.